A few months ago, I broke down and bought an iPod. It was one of those ridiculously impulsive purchases that was somehow justified by the fact that I was buying a new car anyway and I would need some sort of music system for the car, and, all things considered, the iPod was one of the cheaper car-related purchases. And the educational discount put the price around $400 CAN after taxes. And Apple had just announced that their lowest end model (the one I purchased) had been expanded to 15 GB. So really, how could I say no? As usual, what I hadn’t realized is that hardware peripherals tend to spawn extravagant constellations of additional purchases. Apple hardware in particular, and the iPod in specific — having so many active followers — further tends to have a complex software ecosystem associated to it, which has necessitated many changes. Since the damn thing scratches the moment you extract it from its marvellously overengineered flower-box (this guy has documented the entire process of unveilling his new iPod, and that includes opening the cleverly-designed containter), I had to get a case. 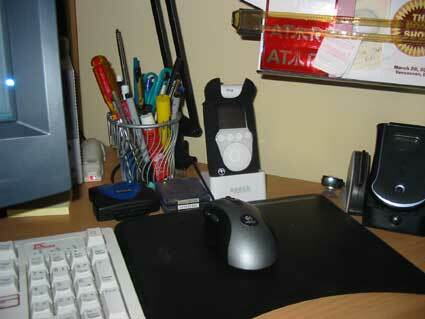 The first of these was the acryllic Speck Flipstand hardcase. While nice and futuristic, it was a tad too bulky, and tended to prevent easy access to the touchpads on the iPod’s face. The DLO neoprene case that I’m currently using doesn’t provide as much impact protection, but the ease-of-use and the ability to clip it from a standard swivel-holster made it a much better choice. I’m still glad I bought the Speck case, though, as it came with a dock-adapter, which is basically a piece of hard plastic with a precisely-cut channel that allows you to attach the Firewire adaptor that came with the iPod — almost as good as the much more expensive Apple dock without the stereo connectors but with more space in the bay to allow for a fully encased iPod to sit in the dock comfortably while charging / playing back. Yes, I know that the iPod heats up something fierce if being used for playback while docked, and that it’s rear aluminum case should be exposed for maximum heat exchange — still, it’s nice to have a dock that fits the case for those moments when you’re only charging the device, rather than listening to music. To take advantage of the iPod in the car, I had to get an FM transmitter (the Mazda 3 not having a cassette deck, and so far, no line-in port). I tried the Belkin TuneCast, but it was bulky, cumbersome, required external batteries, and could only be set to four stations. 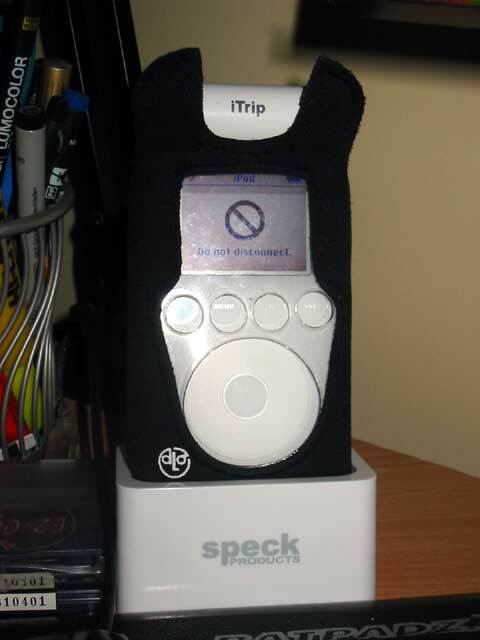 Griffin Technologies iTrip proved to be a singularly better solution — small form-factor, fully configurable from within the iPod (controlled by special music tracks, which allows it to change the frequencey of its transmission band or enables and disables the LED) and drawing power from the iPod’s battery via it’s expansion plug. And, of course, I had to have some method to recharge the thing while in transit, and I found the Belkin iPod Auto Kit to be useful (it’s got a line out, which may eventually be useful, depending on whether or not a line-in module ever becomes available for my car). The biggest series of issues from owning this iPod come from integrating it with my home PC. I’d been using my Mac at work to charge and synchronize it, but my home music collection was significantly larger and more comprehensive than the truncated library I’d ported to my office. This meant that I had to get a firewire card for my PC. Thankfully, the $25 el-cheapo generico 3-port Firewire PCI card from Anitec turned out to be compatible with my iPod (I’d heard lots of non-powering, non-synchronizing horror stories from the iPodlounge forums). Music is currently transferred to the iPod via iTunes, but that’s only because Winamp 5 still doesn’t support smart playlist management for the iPod. Its iPod support plugin (currently at iteration 1.06) works well enough to recognize the iPod and its playlists, allows me to move music to and from the iPod and my comptuer, and can even update song playcounts, but has a glaring flaw in that you have enqueue entire playlists before songs will move from one to the next upon completion. Its rather unfortunate default behaviour is to play a single song, looped endlessly, if you select a playlist and press “play”. Obviously non-optimal behaviour. And I’m sticking with Winamp because it’s hooked into this here blog via plugins and php scripting, and it’s got a smaller memory footprint and doesn’t require me to have three additional services running on my system (iTunes Gearsec service hangs my machine solid when it’s enabled — and since I don’t burn music CD’s, what use do I have for this?). Still, it’s nice to have 2K+ songs with me at any given time. And enough file storage left over to carry a few fansubbed episodes of anime (for watching anywhere there’s a machine with firewire port). Arr. Let’s hear it for crass commercialism!